Powder365 is an excellent company to order powder from. I have never had an issue with a powder from them. Their customer service is unmatched, if you ever have an issue, they will take care of you. They have a pretty good selection of powders and their prices are good as well. Their site is well-organized and very easy to use. The powder comes double-bagged with re-usable zip-ties on each (I like this little touch, I re-use their zip ties all around my garage). My orders never take longer than 4 days to arrive. They have a very active Powder Coating forum on their site as well. All powder paints is also a great place to order powder. Again, I have never had a problem with any of their powders. All Powder Paints seems to have a bigger selection of powders than Powder365 and they also have some specialty colors and unique powders that I have never seen on any other site. My favorite part about their site is they have reviews on their powders. This is a great way to pick one powder over another when all of the powders have the same basic description. Their website is very organized, probably my favorite to use. Prices are about the same as Powder365. 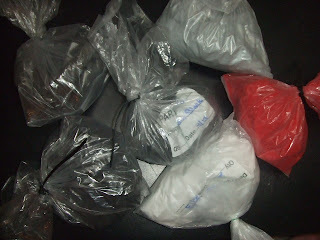 Their powders come double-bagged, each bag being knotted(they could use some of those re-usable zip ties). Shipping is super fast for me but I only live a couple hours away from their warehouse in St. Petersburg, Fl. You know how I said that the big powder manufactures don't want to deal with selling small quantities of powders. Well NIC is an exception. They actually do sell small quantities through their own company called Prismatic Powders. Prismatic Powders offers the biggest selection of powders of any site I have ever seen: 6500+ colors. Their prices are also several dollars lower than the above 2 sites. They offer free color swatches which is great. How a powder looks on your monitor is usually different than how it looks in person. Their website is a little more difficult to use, but with the amount of powders they sell, is understandable. To me, the issue with Prismatic is that they have so many colors, it is hard to pick between them. When a site has 15 gloss blacks, all having the same description, it makes choosing difficult. They do have a huge photo gallery that shows their more popular colors. Their shipping times have slowed down drastically recently. They used to be very fast, but not it may be 2 weeks before your powder shows up. Ordering Powder Outside of the United States? It has been brought to my attention that if you order powder from a US company outside of the US, then you will need them to include a MSDS sheet along with the powder for it to pass through customs. Make sure to request a MSDS sheet if ordering from a US company. Hey Sean- I've been buying from Prismatic and they're fantastic. Definitely! Their selection is unmatched. Wanted to add my recent experience from Prismatic. My order arrived rock hard, and customer service told me that it was my problem and nothing they would do. Will not be ordering from them again Customer service was so bad.....If I ran my business like this I wouldn't be in business much longer.....Very Disappointed. International buyers beware, if the supplier cannot supply MSDS paperwork for each color, you can end up with a big problem as customs will not allow the material into the country and then you have to pay for storage and disposal ( expensive ). Forgot to add, i purchased from AllPowderPaints.com on eBay. They did not reply to my request for MSDS sheets on their powder so i ended up not being able to import to Japan. Now facing large fees for storage then then disposal once they work out how they will deal with it. Definitely good info, thank you. I will add this to the article. Being in the US, it has not been a problem for me, but I will include it for the international readers. Sorry for your trouble with Allpowderpaints.com. They have been very good to me. I will update their info with US only. Hey Sean! Thanks for all the great info. Quick question for you on the powder.. I am looking to get a powder coat setup for myself (always wanted to) and seeing as im up here in Alaska, there are no local shops that do it.. Anyway, I want to do my exhausts, jugs and a couple other things. Do you know anything about high temp powders, or recommendations? Thanks! High temp powder overall has a bad reputation for not being very durable. I personally would rather use a ceramic coating instead which will take all of the heat you can throw at it. Cerakote is a good ceramic coating that can be applied with a touch up gun. They have an air-dry and a oven cure version. Both are great. For the exhaust, you can possibly get away with regular powder coating, I have seen it done plenty and lots of people have no issues, however there are some that have it discolor. I have never heard of any issues at all with powder coating jugs with regular powder. It is a very common thing to have powder coated on a motorcycle. If it were me, I would powder coat the jugs as usual and use some ceramic on the exhaust. Let me know if you have any more questions. Thanks for reading. Thanks for the response Sean! I went ahead and bought the high temp before i even saw you responded.. No big deal. I will try it out and see how it goes. I decided to pick up an ez50.. should be here in a couple days! This will be my first pcoat setup. Now if only i could figure out how to get my frame powder coated.. ha. also, i didn't see anything mentioning pre treatment or anything? Is anything required other than the blasting/scrubbing/cleaning? Thanks! Yeah definitely give it a shot, if it ends up not lasting, its always easy to re-do. Nice job on the EZ50, its a great gun for the price. I will eventually write an article about the pretreatments, but basically they help with adhesion. A lot of bulk powder coaters will use pretreatments in place of sandblasting because sand-blasting thousands of parts a week is just not cost effective. The adhesion, however, is sub-par to sandblasting. Sandblasting will give you much better adhesion. If you want to go above and beyond and have maximum durability, then both can be done. Sandblast first, and then use the pretreatment, usually iron phosphate. You can find them for sale by most of the powder re-sellers. MIT Powder Coatings supplies TDS and MSDS right on the product web pages. They are also happy to include a copy with your order, or email you copies you can print yourself. Hi Sean, just wanted to know what you thought about The Powder Coat Store? This is the color I am after (http://www.thepowdercoatstore.com/neon-pink-powder-coat). It's a SINGLE STAGE color, no base or clear coat required. But the problem is that I'm in Central Europe, Czech Republic to be exact. I guess I'll have to ask for MSDS paperwork. I haven't heard too much about the Powder Coat Store yet but many of their powders have great reviews. Make sure to call or email them when making your order to include the MSDS. Thanx for a great site!! Loving every page of it. I am looking after a copper color with the chrome effect on it. Do you have an idea on how to best accomplish this? I was thinking of a copper first coat, followed bij a chrome second and a clear third. What's your take on that approach? However, if both the chrome and the copper are solid colors, there is no reason to shoot them both as either one will cover the other one entirely. I am doing a transparent coating on glassware.thermoplastic powder coating is used. but not able to get transparent coating. result comes cloudy coating(at ambient)..
what to do to get transparent coating? I've been buying powdercoat from Columbiacoatings.com out of Columbus Ohio,they shipped fast and the product was rather impressive. I occasionally see people selling used powder on powder coating forums and ebay. If the powder is still relatively fresh and has been stored indoors in a dry environment, you can attempt to sell it. Bought sour apple green powder from prismatic, while shooting the powder the gold dust started blotch in in the green.called prismatic took 4 days for return call.The customers service guy there acted like he didn't care . Thursday started to finish fenders, same thing.call again no returned phone call.cant even get tech help. This was purchased thru NIC white city Oregon. I'm over $1300 on this project and still not right. Hello. I have a media blasting cabinet set up in my home garage now for motorcycles and parts. Where would you suggest to buy the equipment that I need to use the powders from these companies? There are lots of used and new powder coating guns out there - hope you found something that works. I like what powderbuythepound makes because they are made with tough parts, and at least partially made in the USA. I know some big companies with a super high workflow that use them, so they stand up to a beating. does anyone know where to get Mil-std-595 color no:36231 powder..? I'm trying to cross reference Mopar R4 to a RAL color. Google didn't help me. Any suggestions? Unfortunately, my resources on this subject are the same as yours (google) and I was not able to find anything either. Until a manufacture specifically produces a color that they state is color matched to Mopar R4, I am afraid that it is going to be a "guess and check" situation. By that, I mean order several samples that you think look the closest, and then try each of them while comparing them to the actual Mopar R4 color, repeat until you are successful. I know that's probably not the answer you are wanting to hear, but if you are dead set on that color for a high-end restoration, I would say it is worth it to do some testing. My best experience has been with TCI. They have really good customer service (my sales rep is friendly and always gives me enough information to decide on the right coating), they have smaller quantities of powder (called "TruPak"), and their powders have consistent results. I've never had a color matching problem with them. I have with other powders. They also have a lot of different effects and textures to choose from. HI GUYS! I´m a powder coating applicator in Arizona for the last 20 yr. Now I have " new and virgin powder coating leftovers" for 30 different colors on several brands (manufacturer) but the majority are "Cardinal". each color is from 1 Lb. to 5 Lb. depends of the color. I don´t want to make fractions on each color and I can publish a list of the inventory upon your request. Each color is for sale "as is the final weight". Thank You! !